CrossFit has a fitness language of its own that leaves many of saying, "um, what?" Case in point: an AMRAP. Until recently, I thought this sounded more like a spa service than a workout. Turns out, “AMRAP” is an acronym for “as many reps as possible.” The intention of this type of workout is to continually push your limits to improve your fitness. The competition doesn’t involve taking down other people—you’re taking down the clock. Game on! AMRAPs can work specific muscle groups, or tax you all over. This 10-minute workout will challenge every single muscle in your body, but it will especially work the shoulders. Even as a fitness professional, I was toast after 10 minutes of this with 8kg dumbbells! Don't worry: You can select the weight of dumbbells that suits your needs while still challenging your muscles. I recommend using a set between 4-10kgs. Lay out a mat and set a clock for 10 minutes. Perform 10 repetitions of each of the following four exercises. Rest for 10 seconds. Repeat until time runs out! Expect to complete 4 to 4 ½ rounds in this amount of time. Stand upright and hold a dumbbell in each hand. Bend your elbows, and rack the dumbbells in front of your shoulders. Spread your legs slightly wider than hips-width apart and turn your toes out (doing so will give your hips more range in the squat). Bend your knees and hips, tracking your knees in the same direction that your toes are facing. 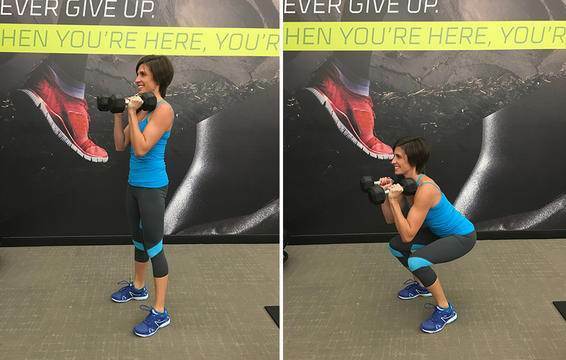 Drop your booty and squat as low as you can without rounding your back or feeling pain in the knees, hips, or lower back. Hold momentarily at the bottom, then squeeze your "cheeks" and rise to the top! Place your knees on a mat, then place your hands on top of dumbbells on the floor. (Holding the shaft of the dumbbells will neutralise your wrists). Position the dumbbells ever-so-slightly wider than the top of your ribcage. Bend your elbows and drop your chest toward the ground—keep your elbows parallel to your body. Tap your nose to the floor and hold momentarily at the bottom, then extend your elbows to rise to the top. Maintain alignment of shoulder-to-hip-to-knee throughout the range. Grip the floor with your toes and hold your hands on top of dumbbells on the floor (for neutral wrists) in plank position. Dumbbells should be positioned directly under your shoulders. Safety Note: Do not use round dumbbells that may roll out from under you. Stand upright and hold a dumbbell in each hand. Bend your elbows, and rack the dumbbells in front of your shoulders. Squat down. Track your knees in line with your toes, maintain a tight core, and look straight ahead. Explode up from your squat. Recruit legs, glute, and shoulder strength to propel (or “thrust”) the dumbbells straight up, overhead. Lift your body out of the squat with such power that your heels raise up off the ground. Maintain complete control of the weight overhead at the top and align wrist over elbow over shoulder, over hip, knee, and ankle! Safely return to starting position.